This is one of my favorite dishes. I usually make it each time I do my Roasted Sticky Chicken recipe, and I will double the recipe and freeze one 8×8 pan. 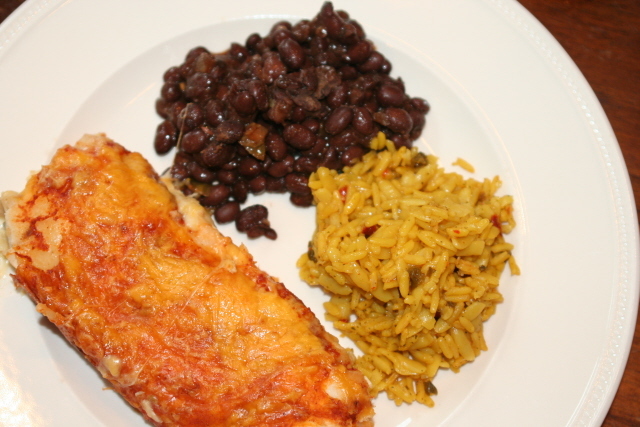 I serve it with black beans and mexican rice packets from Knorrs (or whatever rice I have on hand!). Combine chicken, soup, sour cream and green chiles and mix to make filling. Spray an 8×8 pan. Fill each tortilla with about 1/2 cup filling, and roll up and place seam side down. Continue until mixture is used or you run out of room. If you add a little more chicken, you might get 2-8×8’s out of this. Pour enchilada sauce over, and cover with cheese. Bake covered for 15 minutes, and 10 minutes uncovered. Garnish with things like… green onions, diced tomatoes, sour cream, hot sauce (my fav! ), whatever you like! Place all items in sauce pan and bring to simmer and cook until liquid is thick. Love this recipe! Do you cook it all before freezing? or do you put the enchiladas together and freeze before cooking? I usually cook AFTER freezing. I have to cook it a lot longer though, usually about an hour or so total. Finally made this recipe…I believe it’s going to be a family favorite. Absolutely delicious. The recipe looks delicious! Do you put it in the oven frozen? Do you find that the enchiladas are mushy when you cook after freezing? Wanting to make this for a friend who just had a baby… Thought it would be nice to take a dinner ready-to-eat and an extra dinner for her freezer! This is a good recipe. I actually had some leftover pork roast in the freezer that I tried instead of the chicken. It was also very good! This is the 3rd time I have made your chicken enchiladas – so easy and a great way to use up leftovers. I made your black beans with it tonight, and it was the perfect accompaniment! A tip for others, I had leftover enchilada filling, so I am going to make white chicken chili using the leftover rice, beans and filling. Add a few other ingredients and it should be a hit. I love that the crock pot will make it all come together in moments. Thanks for sharing your wonderful recipes, I have tried a bunch of them and they have all been a success! !